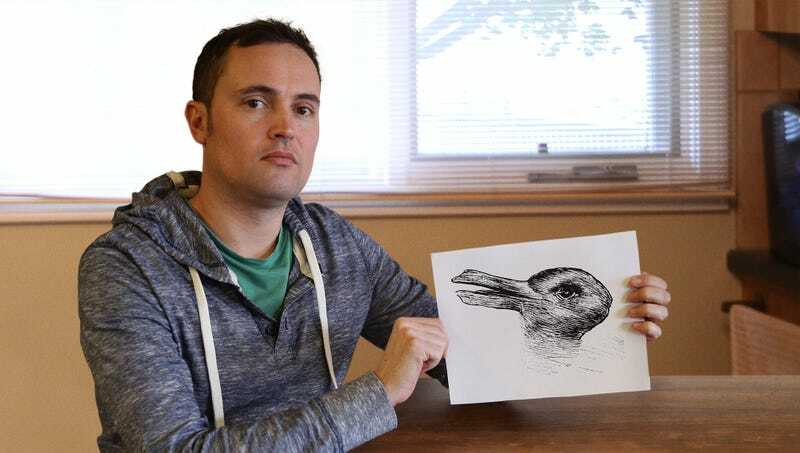 NAMPA, ID—Overcome by a sense of shame and betrayal upon realizing his life has been based on a lie, Allen Shearer told reporters Tuesday that he might never trust again upon realizing that his treasured line drawing of a duck has actually been a rabbit all along. “My duck! No! What happened? How could I not see? How was I such a fool?” said Shearer, gnashing his teeth at the thought that the jaunty waterfowl hanging on the wall of his study had always been a slightly pensive mammal. “Wait, thank heavens, the duck is back. Oh, God—now it’s a rabbit again! If this is a lie, then what else in my life has been a lie, too?” At press time, Shearer was attempting to console himself by gazing at his beloved picture of a beautiful young woman with a feather in her hat.